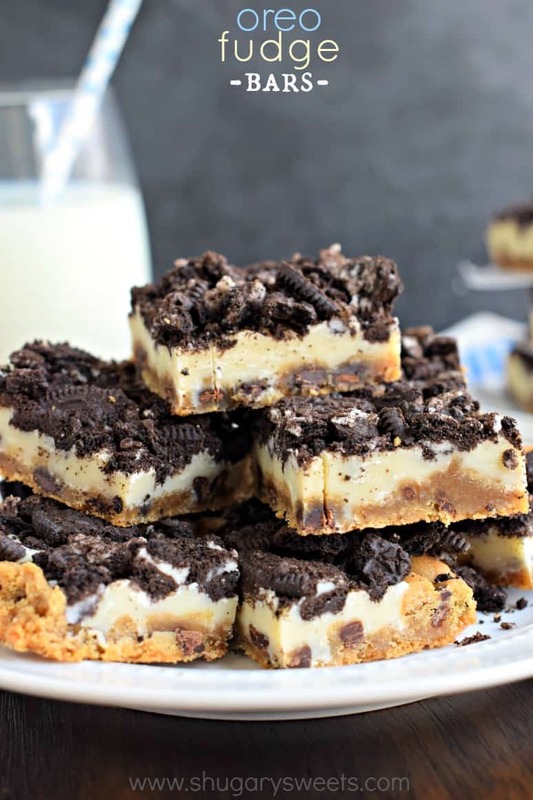 One bite and you will discover how truly blissful these Oreo Fudge Bars taste! Share them with friends, or keep them to yourself, I won’t judge! Be sure to sign up for my FREE email subscription…new recipes in your inbox! I just renewed my domain name…which means Shugary Sweets is now FOUR years old! How crazy, right? Have you been following from the beginning? Anyone? Mom? Seriously though, I pinch myself sometimes when I think about how far this blog has gone in four years. Okay, I don’t really pinch myself, but you get what I mean. I’m not going to punish you with my pathetic photos…but if you’re interested in getting a good laugh, you can check out this, this and this! If you took the time to check out those posts, well, thank you?!? And, I’m sorry. BUT, it’s a sign of where I started! Over the past 4 years I have had some great opportunities come my way. Remember this Duncan Hines trip? Or when I got to milk a cow and feed a baby calf? I also had the chance to meet Alex Guarnaschelli in NYC last year. Trust me, not only do I work with some incredible brands, but I have made some truly wonderful friends through blogging. Just to name a few (but OMG this list could go on): Jocelyn, Ashton, and Dorothy have been my rocks since I started this journey. I know with our crazy blog lives we all don’t connect as much as we used to….but I also know that if I ever need a friend, or advice, these girls are there no matter what! Amanda makes me laugh on a daily basis. This girl is funny! And her faith is rock solid inspirational. Jocelyn is a girl who is going places, and I’m so blessed to have met her! Lisa and Anna are the sweetest gals ever! I had so much fun sitting poolside with these ladies last summer, and if they were my neighbors I know we would be BFF’s! Amber is my “all things blogging” guru. Question about SEO, ad networks, or google? She’s my gal. She also has put up with me as a contributor over on Food Fanatic, and my crazy fudge recipes! I hate that I started naming people, because I know I’m leaving so many out! You know who you are though! Your repeated comments don’t go unnoticed. Your scheduled pins and tweets mean the world to me! So thank you! Let me not forget the millions of you who have visited and supported me and my blog…whether you read on a daily basis, comment or pin my stuff. I heart you all. Without all of you, I don’t know where I would be! I’m so happy to hear when a recipe was a huge hit at a birthday party, or a weeknight meal. So keep the feedback coming, my friends! I could fill a whole blog post about all the amazing people I have met online and in real life thanks to blogging! 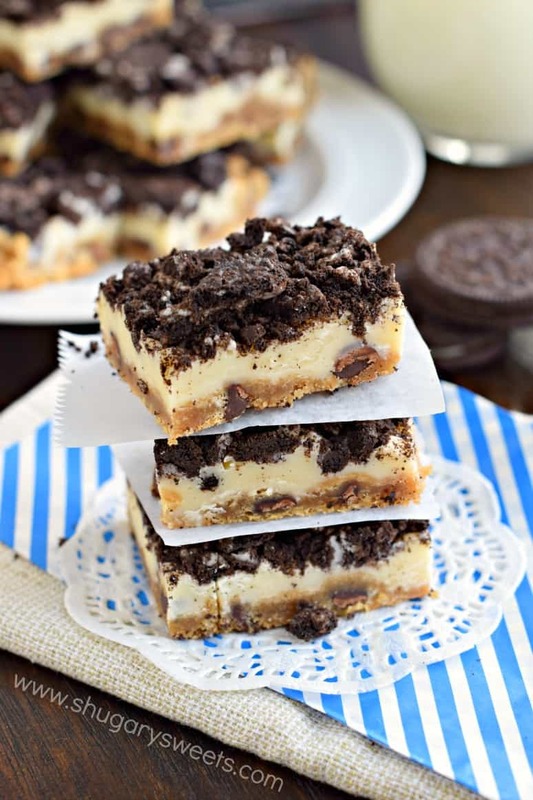 But then there would be no time to talk about these Oreo Fudge Bars! And these bars need some attention, trust me. 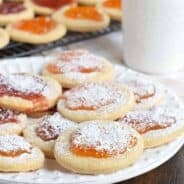 Only 4 ingredients needed for these amazing treats! I started with a chocolate chip cookie dough base. And yes, I used refrigerated cookie dough, cause sometimes a recipe just works best with pre-made cookie dough. While it was baking, I melted some white chocolate chips with sweetened condensed milk. Did you know that using sweetened condensed milk with chocolate chips creates a magical two ingredient fudge? Yeah. Mind Blown! You may remember when I used it here and here. Anyways, I used white chocolate chips. When the cookie bars came out of the oven I let them cool slightly, then poured the white chocolate mixture over the top and pressed crushed OREO cookies into the top. Go big or go home! These bars won’t last long if you share with friends! And..I’ll be your friend, so please share with me! 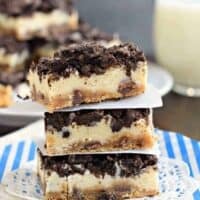 Delicious 4 ingredient Oreo Fudge Bars! Preheat oven to 350 degree F. Line a 15 x 10 x 1-inch baking sheet with parchement paper. Press cookie dough into parchment paper lined pan. Bake for 17-19 minutes, until lightly browned. While cookie bars are baking, combine sweetened condensed milk and white chocolate morsels in a glass bowl. Microwave for one minute, stirring until combined. Heat an additional 30 seconds, and stir until smooth. When cookie bars come out of oven, allow to cool about 10 minutes. Spread white chocolate mixture over cookie bars and immediately press the crushed OREO cookies into the top. 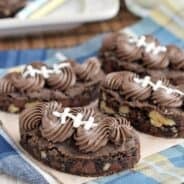 Chill for 30 minutes, cut into bars and enjoy! Love these easy cookie bars? Here are a few more ideas…. 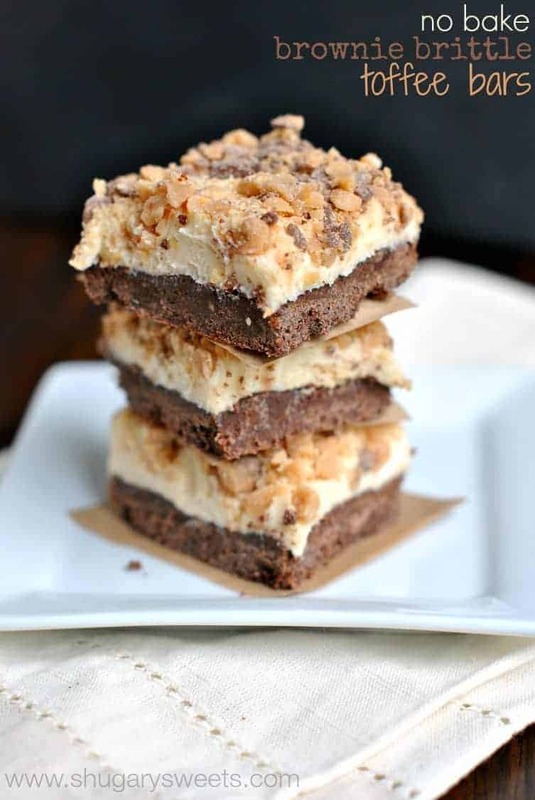 No Bake Brownie Brittle Toffee Bars: these have been proclaimed one of the best desserts in my kitchen! 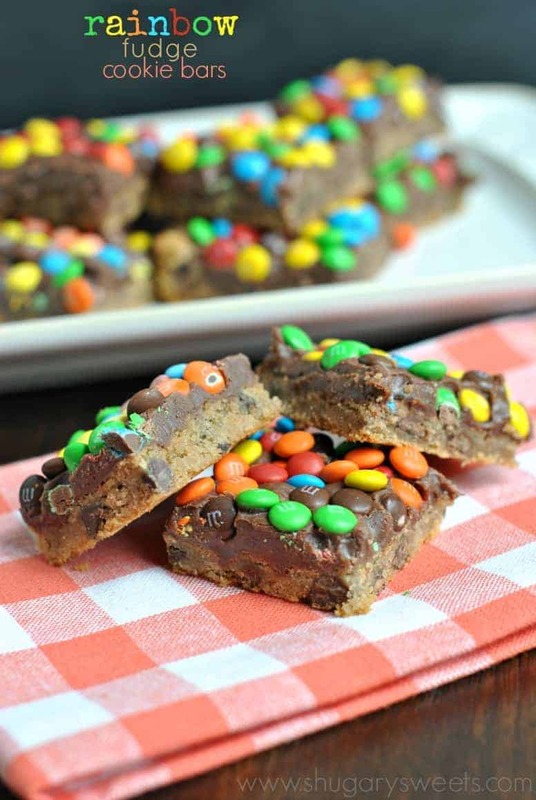 Rainbow Fudge Cookie Bars: another super easy cookie bar recipe! 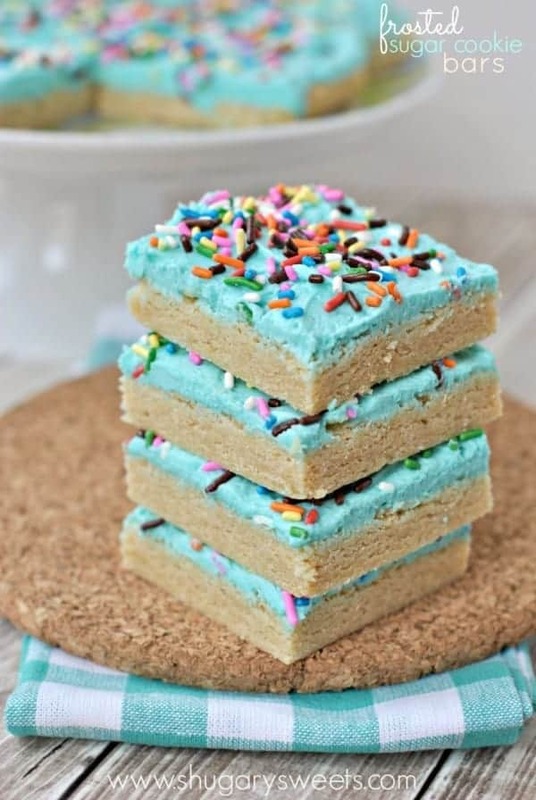 Frosted Sugar Cookie Bars: because let’s face it, bars are easier than cut out cookies! Happy blogiversary, Aimee! I can’t think of a better way to celebrate with these bars. They look amazing! WOW. These pics definitely caught my attention. Happy blogiversary! I’ve been reading and loving every word and pic for so long! I’m glad you have all your bloggy friends to celebrate with, and I really love the work you do! Yes you have! Thanks for always being supportive of my blog, and commenting 🙂 You’re entirely too sweet!! Happy 4 years Aimee! I love your blog! 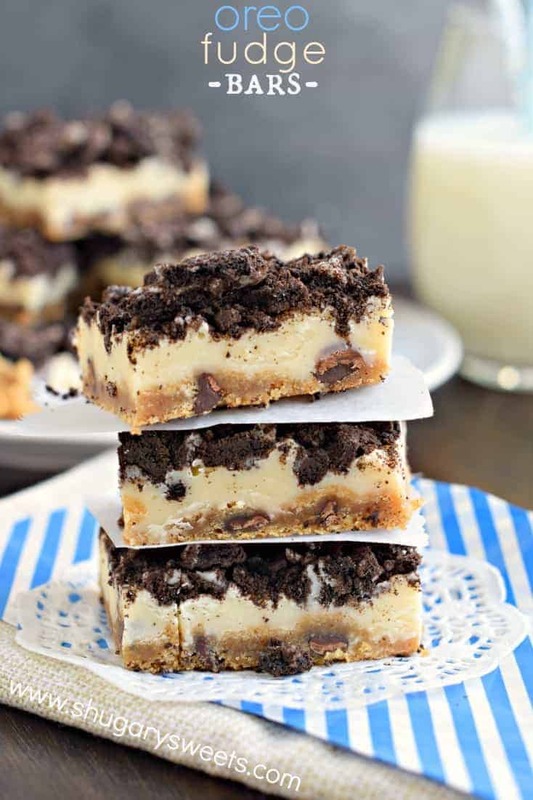 The redesign looks amazing and all your recipes are so mouth-watering – especially these fudge oreo bars – wow!! Aww!! You inspire me Aimee! Oh my dear…your photos inspire ME! Sweetened condensed milk makes fudge so easy. I love it! Congrats on 4 years. I’m at just about 2 years and realize how hard it is to bring consistent good quality and build a stellar audience. You’ve done both so well! Thank you so much Melanie. And thank you for being one of those people I mentioned, who I know visit and comment regularly. Love ya!! Congrats! Hasn’t that 4 years gone by so fast?! These bars are the perfect way to celebrate!! These bars are the perfect way to celebrate!! Happy Fourth blog birthday 🙂 So glad to know you!! I love the new format. It’s wonderful. Congratulations on having your blog going for four years. That’s simply amazing. 🙂 These bars are dynamite! I need to try these very soon. HAPPY BLOGIVERSARY, Aimee! I hope it’s been a great one and I know I’ve loved following along your blogging journey this whole time 🙂 These 4-ingredient bars are the perfect way to celebrate 4 magical years of blogging! I love that you mixed the condensed milk with the white chocolate chips and not with heavy cream like you would in a regular ganache recipe! I need to try this! Thanks Johlene! It hardens up nicely yet is smooth when you bite down. And these bars are the best way to celebrate-fudgy and oreo deliciousness! Happy Blog Birthday! I love your blog and all of your recipes. This was where I started my love for biscotti. I’ll always be in your debt. 😉 And your 1st pictures aren’t even that bad. You should see mine. I used a flash! Gosh the hoar huh? This blogging community is pretty awesome and I have only scratched the surface. I love all the friends I’ve made so far and can’t wait to meet more. Your awesome Aimee and can’t wait to see what you do next…COOKBOOK? Fingers crossed. 😉 These bars looks delicious and I am so trying these asap! These bars look amazingly delicious! Congratulations on 4 years and thanks for the sharing my monster cookie bars. These look amazing, can't wait to try them! Thank you Holly 🙂 You’re so sweet! I’m so glad you started blogging because now I have you as a friend!! <3 Love these bars, send me some as a celebration mmkay? Delightful! Very delightful! This is how I would describe these Oreo fudge bars. They are just so perfect and to add, they are also very mouthwatering. Well done on four years – and so many wonderful recipes! 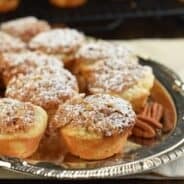 I stumbled across you on pinterest and have a row of tabs open of you recipes to try!! I definitely don’t do “low sugar recipes” well enough for diabetics 🙂 Enjoy the recipe!!! Wow – looks fantastic. I want to make for my husbands birthday. Maybe you can give me some tips. This will be 1 of 4 different dessert i’ll be making. Would you make more than the recipe calls for? How long in advance can I make them? How do I store it so it keeps most delicious?